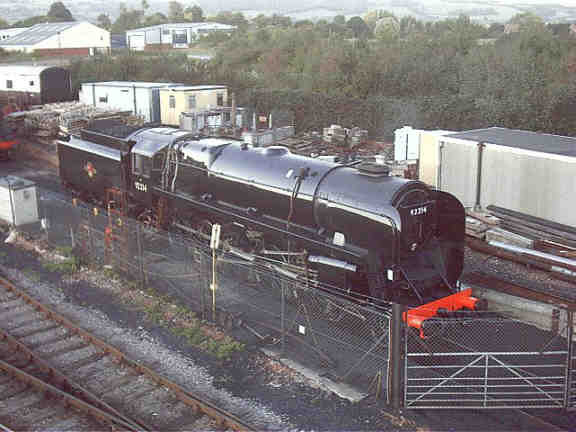 This page has brief details of the steam locos that visited the WSR from the 2002 season on. For resident and visiting locos during 2006 click here. 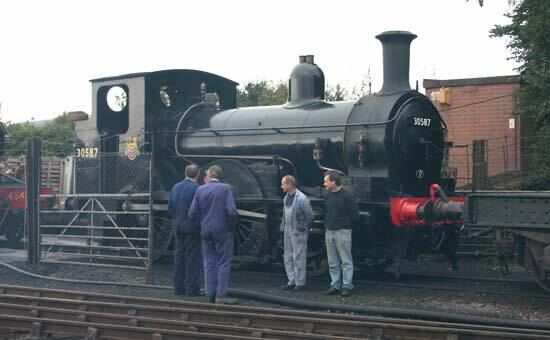 For resident locos that are undergoing restoration click here. 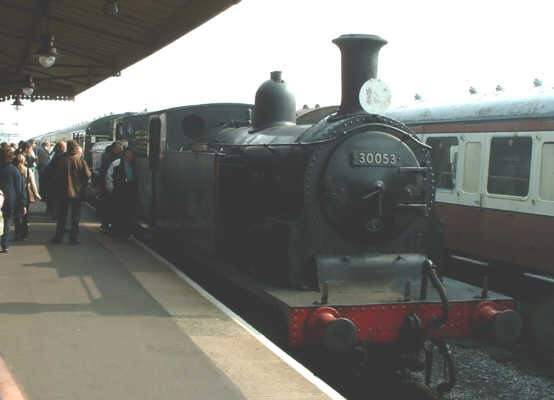 1369 visited from the South Devon Railway for the Autumn Steam Gala 2003. 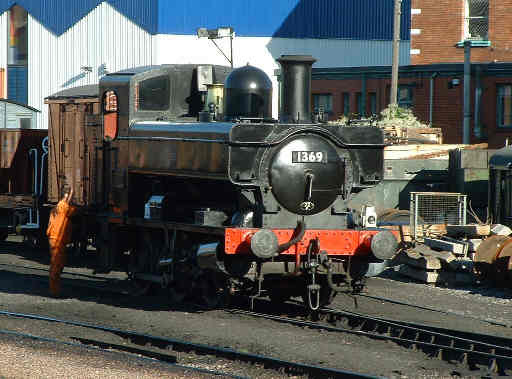 She is a member of the 1366 Class of 0-6-0PT pannier tanks, designed by Collet they were built in 1934. Weight: 41 tons 6 cwt. Driving Wheel diameter: 3' 8"
1450 is an ex GW 0-4-2T, she visited the line for the Spring Steam Gala 2005. They were designed by Collet and introduced in 1932. Weight: 41 tons 6 cwt. 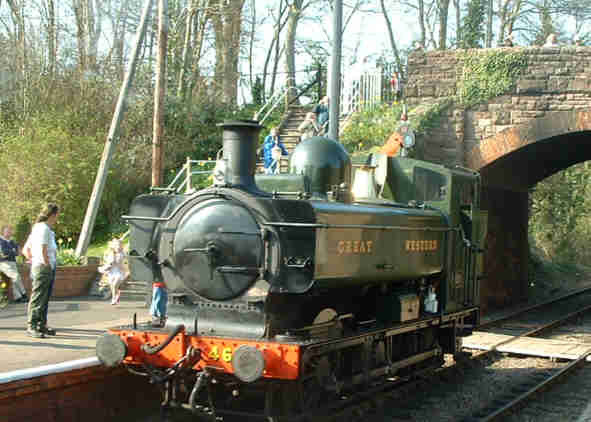 Driving wheel diameter: 5' 2"
1501 visited the line for the Spring Steam Gala and is pictured here at Bishops Lydeard. 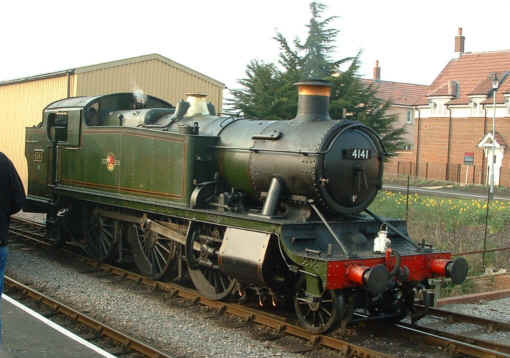 3440 City of Truro is a City Class 4-4-0, she was built in 1903 and is famed for being the first loco to exceed 100 mph on Wellington Bank in 1904. 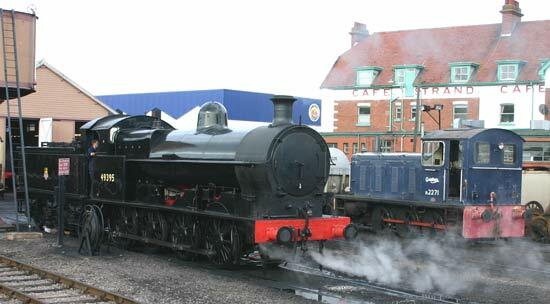 She visited the WSR for Spring Steam Gala 2005 . Weight (inc tender): 90tons Driving wheel diameter: 6' 8 1/2"
4141 visited from the Llangollen Railway for the Spring Steam Gala 2003, it, like resident 4160, is a member of the ex GWR 5101 Class of 4MT 2-6-2T Prairie tanks. 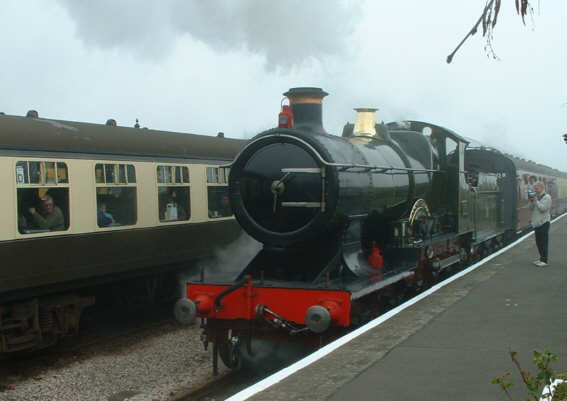 The class was introduced in 1929 based on a Collett rebuild of the Churchward 3100 Class. Weight: 78 tons 9 cwt. Driving Wheel diameter: 5' 8"
Weight: 49tons Driving wheel diameter: 4' 7 1/2"
4936 Kinlet Hall visited the line for the 2005 Spring Steam Gala after spending the previous high season on the Wizzer. 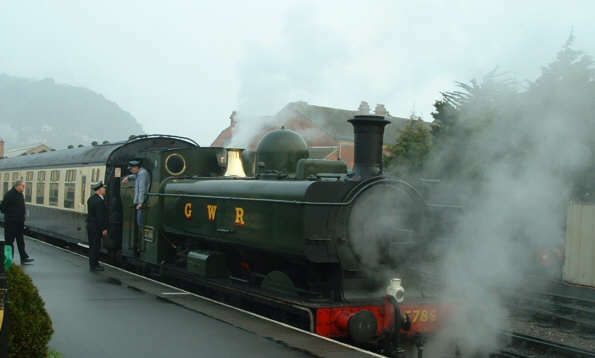 She is a 49xx Hall Class 5MT 4-6-0 which was introduced in 1928. Weight: 75 tons (loco), 46 tons 14 cwt. (tender) Driving wheel diameter: 6' 0"
Boiler pressure: 225 lb/sq. in. Tractive effort: 27,275 lb. 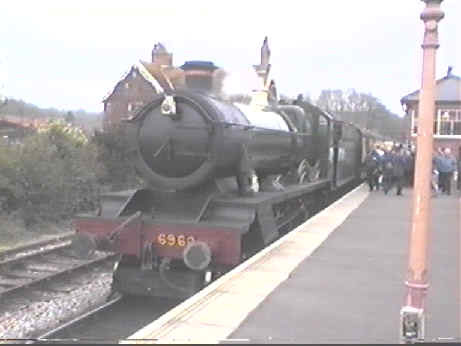 5051 Earl Bathurst visited the line for the Spring Steam Gala 2002, arriving with a special, staying for a while before leaving with another special from Taunton. 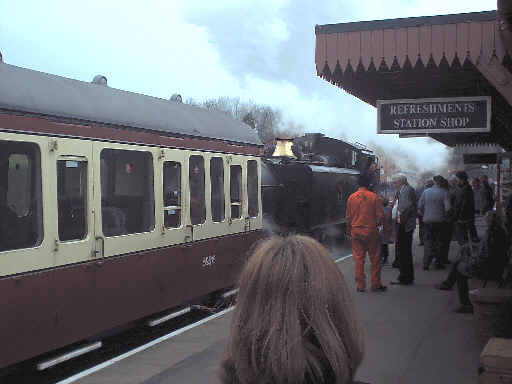 She paid a return visit in 2003 for the Cross Country Weekend and again for the Spring Steam Gala 2005. 5051 is a 4073 Castle Class 7P 4-6-0. Weight: 79 tons 17 cwt. (loco) 46 tons 14 cwt. (tender) Driving wheel diameter: 6' 8 1/2"
Large prairie 5199 visited for the Autumn Steam Gala 2004, she is seen here the weekend before working a Bishops Lydeard to Minehead train at Williton. 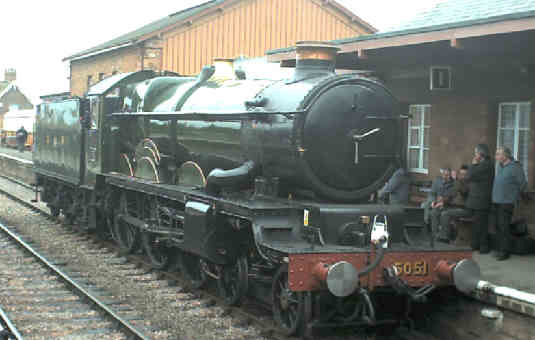 She is from the same class as the lines resident 4160 which is at present away for overhaul. 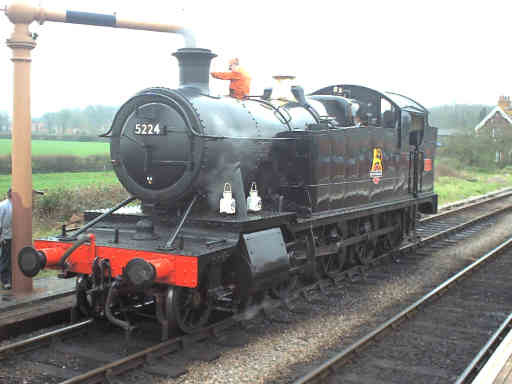 5224 belongs to Waterman Railways, she visited the line during the Spring Steam Gala 2003 and again from July onwards. She is a member of the GWR 5205 Class of 8F 2-8-0T tanks which were introduced in 1923 as a development of Churchward's 4200 Class. Weight: 82 tons 2 cwt. Driving wheel diameter: 4' 7 1/2"
5542 was a resident loco, she is at present away from the line, mainly at the SDR. 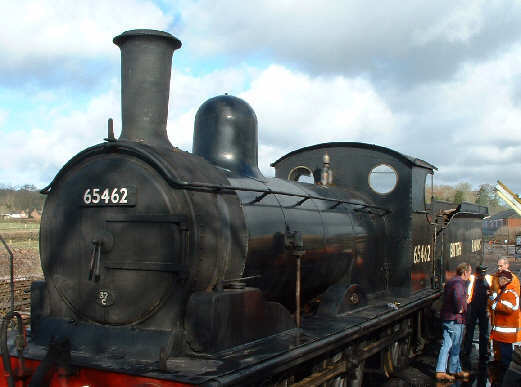 She is a member of the ex GWR 4575 Class of 2-6-2T prairie tanks - the small prairies - which were introduced in 1927. The loco's web site is G.W.R. Locomotive 5542. Her sister, 5553 visited for the Autumn Steam Gala 2003 and the Spring Steam Gala 2004, as did another of the same class, 5552 from Bodmin. 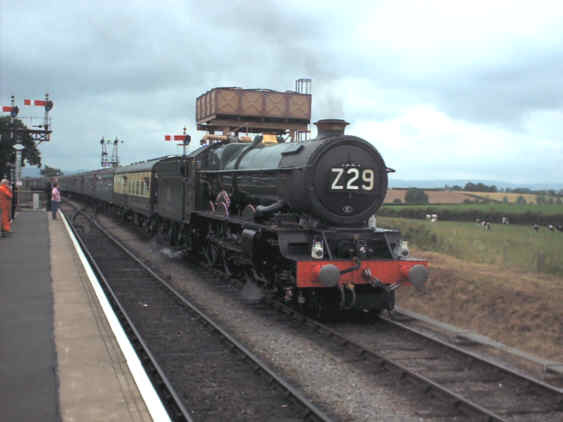 The Three Prairies are seen here triple heading an Up train at Bishops Lydeard. 5553 will be on the line for the 2005 and 2006 seasons. Weight: 61 tons Driving wheel diameter: 4' 7 1/2"
5637 visited from the East Somerset Rly for the Autumn Steam Gala 2003. She is an Ex Great Western 56xx class 0-6-2T built for service in the Welsh Valleys. Weight: 68 tons 12 cwt. Driving wheel diameter: 4' 7 1/2"
5764 (left) from the Severn Valley Railway and 5786 (right) from the South Devon Railway visited for the Spring Steam Gala 2003. 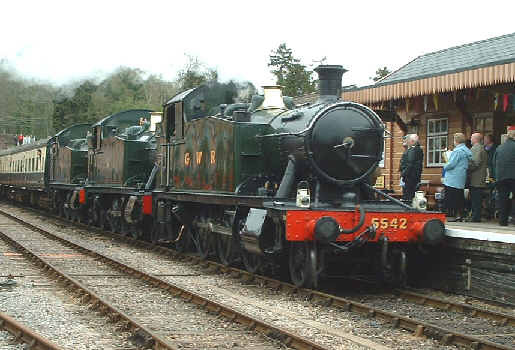 They are both members of the ex GWR 57xx class of pannier tank introduced in 1929 for shunting and light goods work. Weight: 47tons 10cwt. Driving wheel diameter: 4' 7 1/2"
6024 King Edward I arrived on the line at the head of a through excursion before appearing at the 2005 Spring Steam Gala working services over Easter as well. 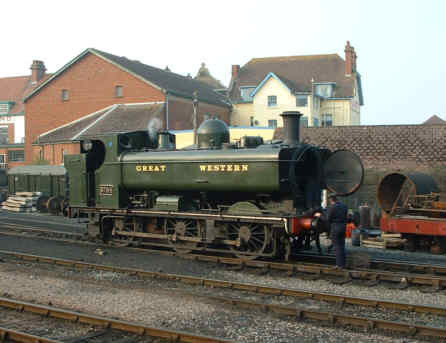 She is a member of the famous GWR King Class of 8P 4-6-0's. Weight: Driving wheel diameter: 6' 6"
6960 Raveningham Hall visited the line for the Spring Steam Gala. She is a member of the ex GWR 6959 Modified Hall Class of 5MT 4-6-0's which was introduced by Hawksworth in 1944. Weight: 68tons 18 cwt. (loco), 40 tons (tender) Driving wheel diameter: 5' 8"
9466 is a member of the 94xx class of heavy shunting 0-6-0PT's introduced by Hawksworth in 1947. They are a taper boiler development of the earlier 57xx panniers. Weight: 55tons 7cwt. Driving wheel diameter: 4' 7 1/2"
30053 is an ex LSWR M7 class 0-4-4T, designed by Drummond in 1897. 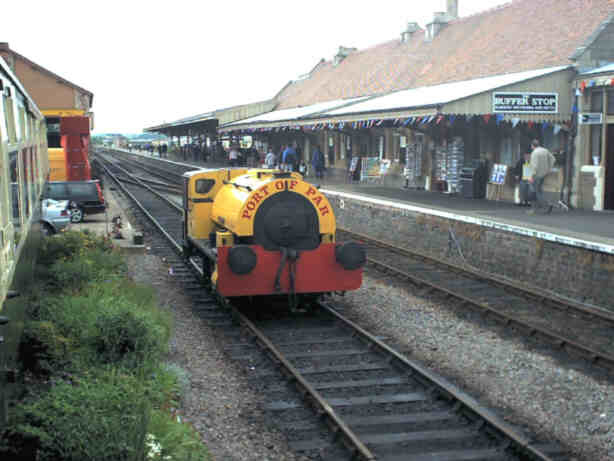 This venerable old lady visited us from the Swanage Railway for the Spring Steam Gala 2003. Weight: 60 tons 4 cwt. Driving wheel diameter: 5' 7"
30587 is an ex LSWR 2-4-0WT Beattie well tank, she visited for the Autumn Steam Gala and Great Trains Extravaganza in 2005. Rebuilt Bulleid West Country Pacific 34027 Taw Valley visited for the Spring Steam Gala 2004 where she ran as 34022 Exmoor to mark the 50th Anniversary of the National Park. 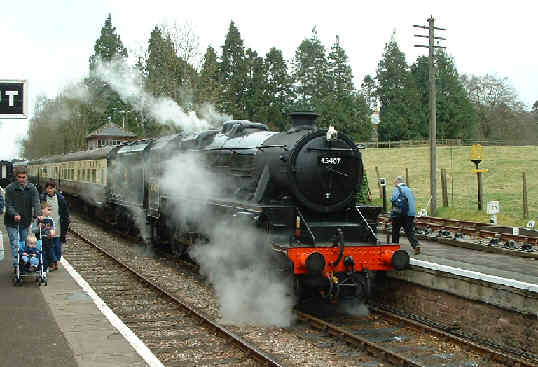 She is a Class 7P5F 4-6-2, rebuilt from Bulleid's original design of 1945 during the 1950's. Weight: 90 Tons 1cwt. Driving wheel diameter: 6' 2"
Boiler Pressure: 250 lb/sq.in. Tractive effort: 27,715lb. 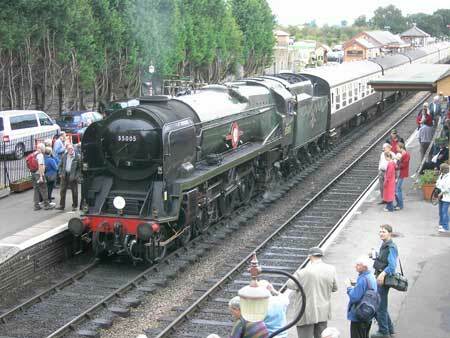 Another Bulleid pacific, this time Merchant Navy class 35005 Canadian Pacific. 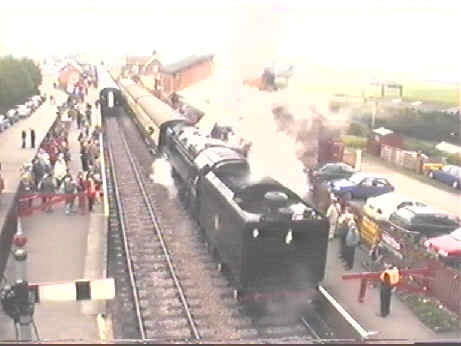 She visited for the 2005 Autumn Steam Gala. Weight: 97 Tons 18cwt. Driving wheel diameter: 6' 2"
Boiler Pressure: 250 lb/sq.in. Tractive effort: 33,495lb. 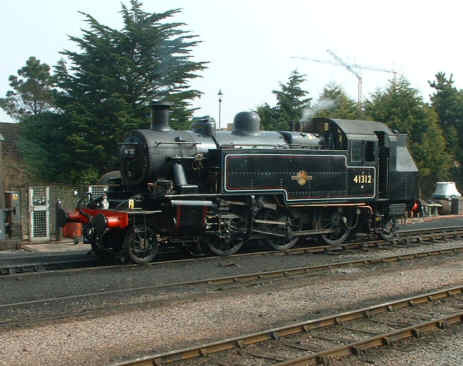 41312 is an Ivatt 2MT 2-6-2T, built after nationalisation to an LMS design. 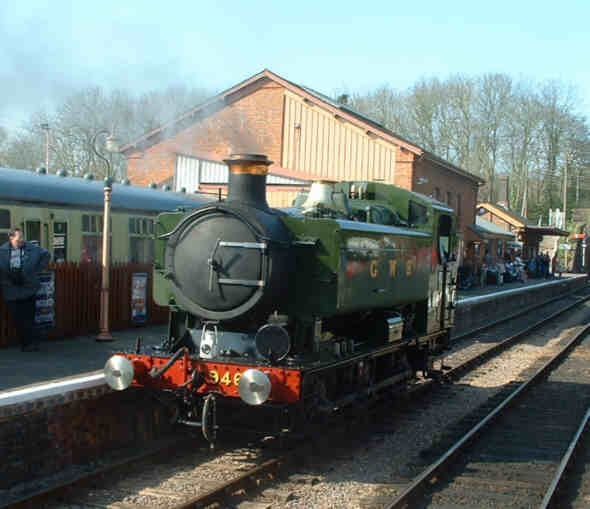 She visited for the Spring Steam Gala 2003 from her base on the Mid Hants Railway. Weight: 63tons 5cwt. Driving wheel diameter: 5' 0"
Boiler pressure: 200 lb/sq. in. Tractive effort: 18,510 lb. 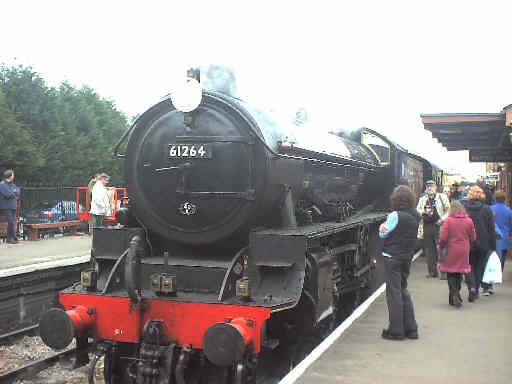 Stanier LMS Black Five 45407 visited for the Spring Steam Gala 2004. This class once numbered over 800 locos and could be seen the length and breadth of the country. 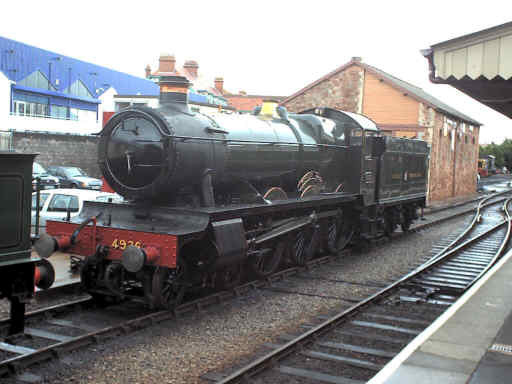 45407 belongs to Ian Riley. Weight: 72 tons 2 cwt. Driving wheel diameter: 6' 0"
Recently restored 49395 visited for the 2005 Autumn Steam Gala, she is an ex LNW G2 "Super D" 0-8-0, part of the national collection but restored by Pete Waterman. Weight: 62 tons Driving wheel diameter: 4' 5 1/2"
Another visitor for the Spring Steam Gala, 61264 is an ex LNER B1 Class 5MT 4-6-0 designed by Thompson in 1942. Weight: 71 tons 3 cwt (loco), 52 tons (tender) Driving wheel diameter: 6' 2"
Ex GER/LNER Class J15 0-6-0 65462 visited the West Somerset for the Spring Steam Gala 2004. She is a real old timer having been built in 1912! BR Standard 2-6-0 76079 visited for the Spring Steam Gala 2004. This class was designed by BR and introduced in 1953. 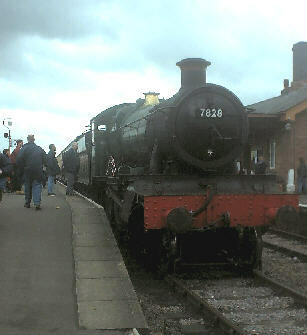 76079 belongs to Ian Riley. Weight: 59 tons 2 cwt Driving wheel diameter: 5' 3"
The final visitor for the Spring Steam Gala, 92212 is a BR Standard 9F 2-10-0, the last new class of steam loco, appearing in 1954. She was built in 1959 and had a very short working life on the mainline. 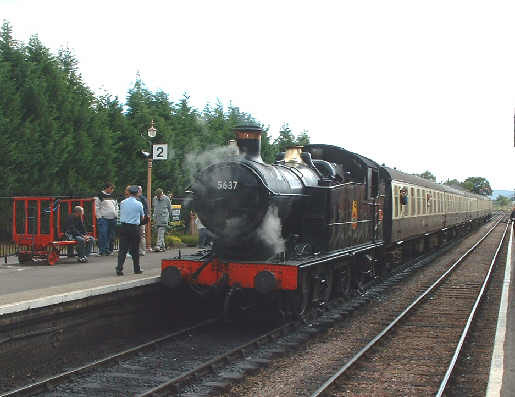 Another visitor for the 2004 Autumn Steam Gala was BR Std. 9F 2-10-0 no. 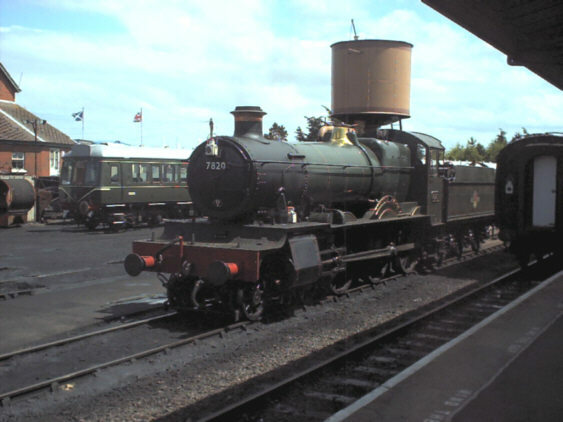 92214, seen here in the loco compound at Bishops Lydeard. Weight: 86 tons 14 cwt (loco) Driving wheel diameter: 5' 0"
Alfred visited for the Thomas Weekend where she appeared as Ben, she is a 0-4-0ST originally working in the Port of Par where a low bridge required the extremely low height loco. 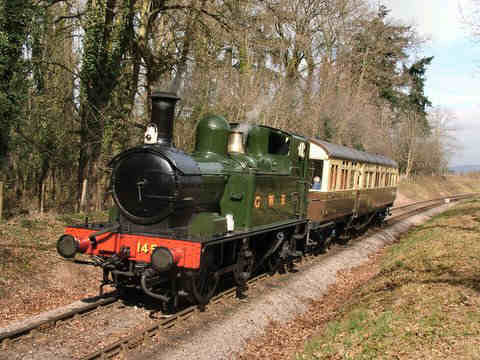 Alfred's home base now is the Bodmin & Wenford Railway.